"A Touch of Class For Any Occasion"
Thank you to WFMJ for inviting the Elegant String Quartet to perform at the 2012 WFMJ Today wedding! We had a wonderful time and it was a fantastic experience! 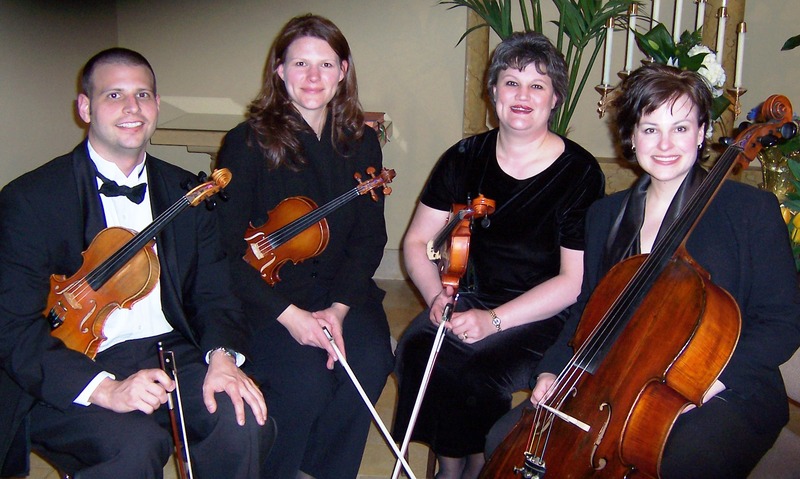 The Elegant String Quartet provides professional musical service at special events in the Youngstown/Warren, Ohio and Sharon, Pennsylvania areas. Although we specialize in weddings and receptions, we can also be heard at corporate and private parties, in backyards and at banquet halls. The members of the Elegant String Quartet have extensive musical experience. Together, we perform at approximately 30 events annually, including the Stambaugh Bridal Show and our Christmas Concert at St. James in Boardman Park. Individually, our members perform with the Youngstown Symphony Orchestra, and the Ashtabula Symphony, and also teach in private studios. Why choose a string quartet for your celebration? A string quartet provides an elegant, yet relaxing atmosphere for your guests. When planning a wedding or party, always consider what your guests will be hearing as they walk through the door. A string quartet can set exactly the mood you are looking for. Whether it is an atmosphere that is solemn and reflective, or bright and celebratory, we can help you choose the music to suit your desire.